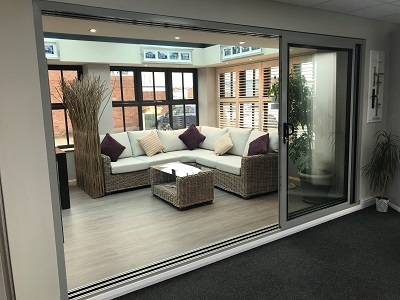 With an in-line Patio Door your room will feel instantly brighter and up-lifting bringing the outside in and creating a whole new living experience. In-line Patio Doors are ideal where space is an issue since the in-line sliding action does not encroach on room internally or outside space. Householders will no longer have to sacrifice strength for the largest window in their home, the Patio Door. Each Patio Door is manufactured using the highest grade materials and to the finest of tolerances to provide a tight seal that keeps out the winter chill and the summers heat at bay. 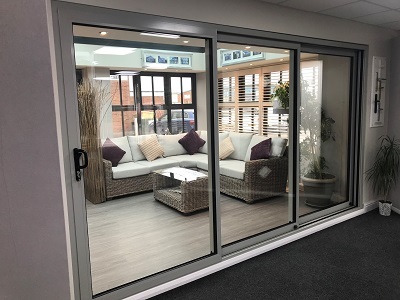 Security is a priority in the design of our in-line Patio Doors and all our doors are fitted with a combination of an enhanced lock and security handle that makes the door amongst the most secure available. 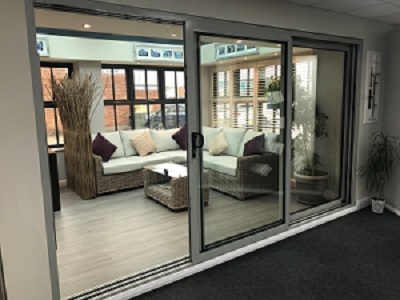 All Patio Doors come complete with an Anti Lift mechanism preventing the sliding door being removed externally by leverage with a spade or a crow bar. We also offer an aluminium low threshold option that enables easy access for wheelchair users. A range of glazing options are available, giving increased energy efficiency, solar control and security. PVCu Patio Doors in White, Anthracite Grey, English Oak, Rosewood, Mahogany, Cream, Ivory, Black, Light Grey & Chartwell Green Woodgrain Foil Finishes.